Fig:XA001: Aerial view of Xochicalco’s Central PlazaThe Central Plaza at Xochicalco is a mysterious hotchpotch of architectural styles and is built on a rather curious alignment. 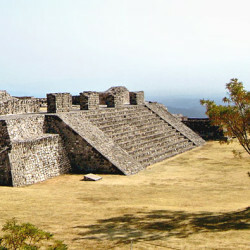 The alignment is approximately 15º east-of-north, which is also found at Teotihuacan. 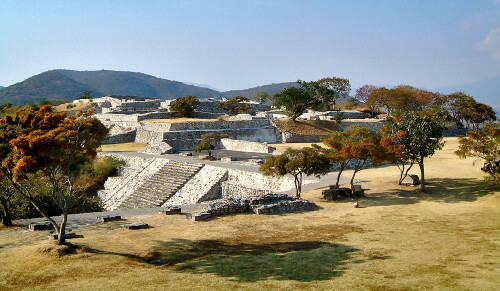 The Central Plaza would be squared was it not for the addition of the Temple of the Stelae, which is situated on an isolated extension to the south and curiously built in a self contained “System” – a style found at Monte Alban. 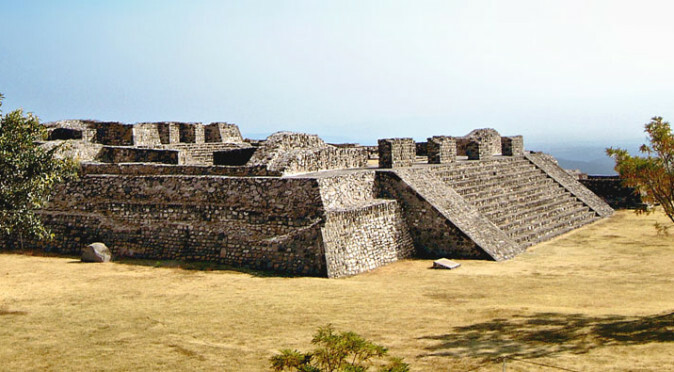 To the north of the Central Plaza is the Northern Ball-Court, which was built in the less common style with high walls and is also very reminiscent of Monte Alban. 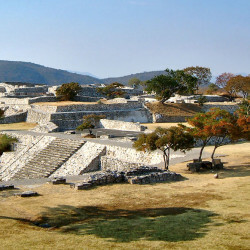 The Northern Ball-Court and the East Complex, which is directly east of the Central Plaza, are also built on the same off-set angle, whereas to the south, the Plaza of the Two Glyphs and the South Complex are aligned on a strict north-south east-west axis. 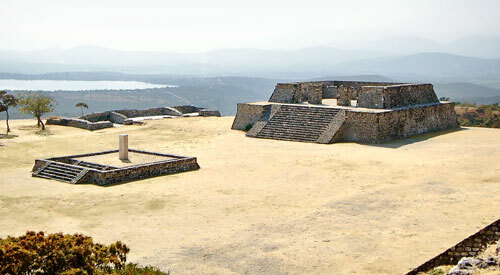 Exactly why the site features two alignments is uncertain, but the alignment of the Central Plaza is the more sophisticated, for it is probably designed to observe the sunset on the western horizon on the zenith-day, where it sets approximately 15º north-of-west. 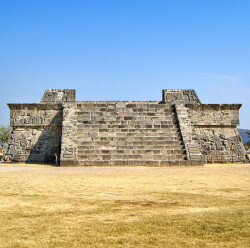 The zenith was an integral part of the Sacred Calender at Xochicalco, for the number of days between the summer zenith and the returning spring zenith is 260 days. If the zenith also marked a very significant event in the agricultural-cycle of maize, then it would possibly explain the true purpose of the 260 day calendar and adjust the way we perceive it to have worked. 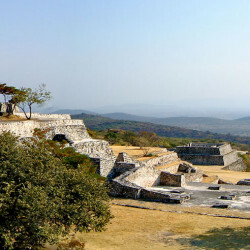 Monte Alban also features two alignments, with System M and System IV both offset approximately 15º from the strict north-south axis of the city’s ceremonial core. 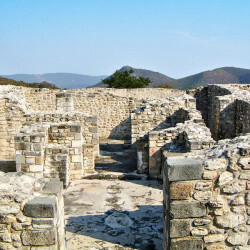 Interestingly, they also use the talud-tablero style that indicates a Teotihuanaco influence and are self contained “systems” that feature a raised platform, internal walled plaza, and private temple, just as the Temple of the Stelae in the Central Plaza at Xochicalco does. 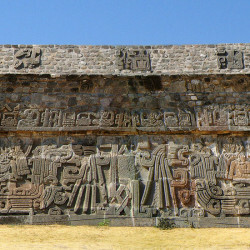 The centre-piece of the Central Plaza is the afore mentioned Pyramid of the Plumed Serpents which is also built in the distinctive talud-tablero style of Teotihuacan. Curiously though, it is also covered in ornate carvings that feature dignitaries dressed in distinctive Mayan attire with many seated in a fashion synonymous with the Mayan artistic style. 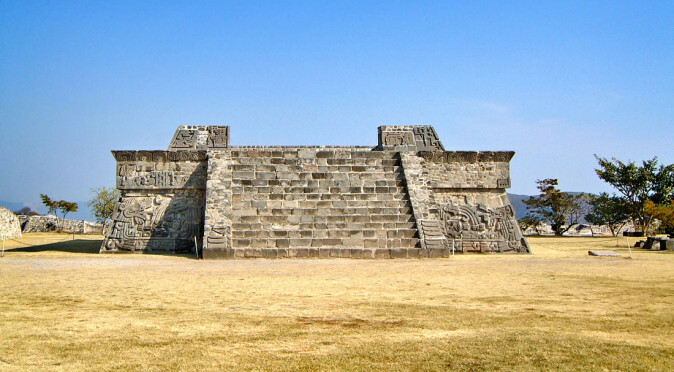 The Pyramid of the Plumed Serpents carved walls are believed to record the meeting of a group known as the “Lords of Time”, who are thought to have visited Xochicalco from across Mesoamerica to witness a celestial event and recalibrate the Sacred and Solar calendars. 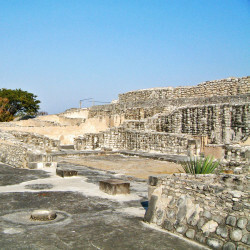 The deliberate alignment of all the buildings on an axis 15º east of north indicates that the Central Plaza’s construction was organised around religious and celestial observation. 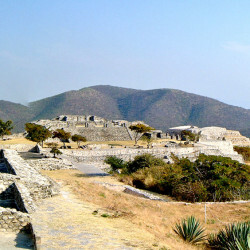 It appears to be a fairly common practise for Mesoamerican astronomers to use mountain peaks and valleys to mark various risings and settings of celestial objects and then build various structures to act as viewing points or create solar effects. W0111: View of Acropolis with hills behind The numerous rooms and compartments of the “Acropolis” on the western flank, and a series of patios and rooms known as the “Unidad Habitacional” on the eastern flank, combined with the traditional viewing platforms that the Central Plaza’s temples and pyramids provided, would have offered a considerable number of viewing and capture points. 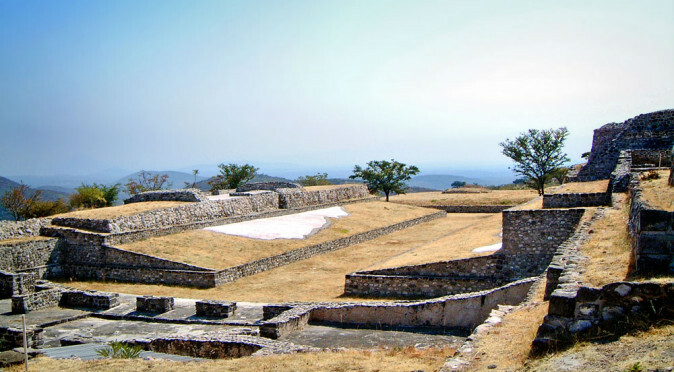 Looking out from the buildings of the Central Plaza and witnessing the spectacular view of the hilly east and west horizons, it is clear that Xochicalco offered a huge number of natural markers on the horizon and was a perfect location for scientific and religious observation. 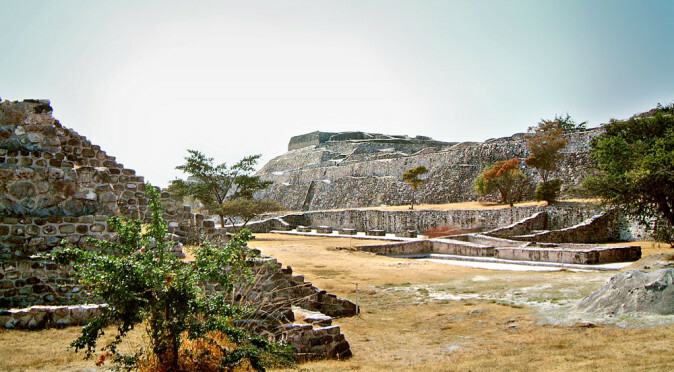 It also seems inescapable that Teotihuacan, or at least the science and religion of Teotihuacan, played a fundamental part in the construction of the Central Plaza. In contrast, the southern section with its strict east-west alignment may have harked to an earlier time, with more simplistic observational needs. 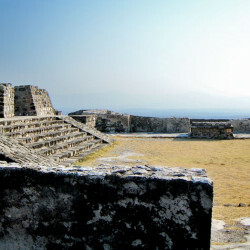 The majestic ruins of Xochicalco sprawl across a hilltop 10 miles south of Cuernavaca. Despite the incredible engineering skills and man-power involved, no-one is sure exactly who built the city. 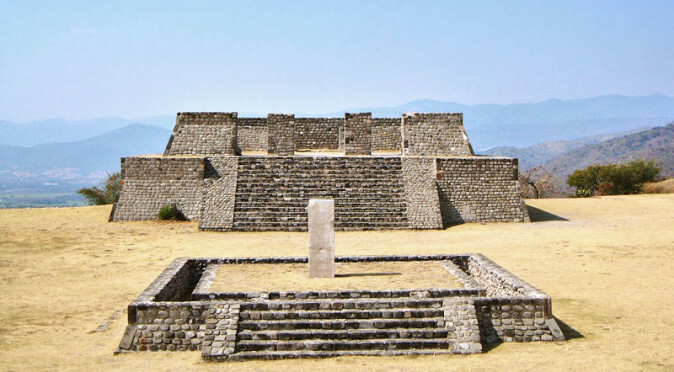 With spectacular views of the surrounding valley, the Pyramid of the Stelea is one of Xochicalco's most incredible monumental structures and home to three mysteriously buried Stelae. 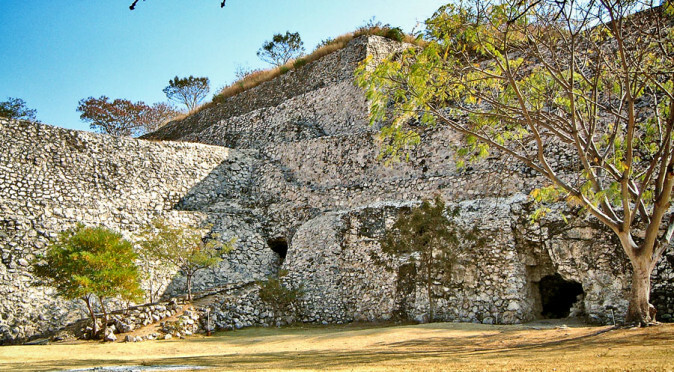 The Eastern Complex doesn't have the amazing views or ornate carving that the other areas of Xochicalco have, but it may have been one of the most important areas, nonetheless. Xochicalco features a very precise zenith-tube, which will illuminate a cave floor with a very bright light when the sun moves directly overhead - but obviously this isn't all it does!